Senator Rand Paul is perhaps even better than I thought he would be. He already is playing a very substantive role on policy, ranging from his actions of big-picture issues, such as his proposed budget that would significantly shrink the burden of government spending, to his willingness to take on lower-profile but important issues such as repealing the Obama Administration’s wretched FATCA law. But he also plays a very valuable role by articulating the message of liberty and refusing to allow leftist politicians to claim the moral high ground and use false morality to cloak their greed for other people’s money. And there’s no better example than what he just did at the Senate hearing about Apple’s tax burden. Wow. I thought I hit on the key issues in my post on the anti-Apple demagoguery, but Senator Paul hit the ball out of the park. If you want other video examples of Senator Paul in action, click here to see him grill a TSA bureaucrat and click here to see him rip an Obama appointee on whether Americans should be free to choose the light bulb they prefer. Jsou i někteří politici (ale zejména v Evropě jich je zoufale málo), kteří naštěstí nesdílejí onu nejen evropskou hysterii typu: Všechny síly proti “agresivnímu daňovému plánování, proti “unikům do daňových rájů”, které ve skutečnosti neznamenají nic jiného než “vyberme maximální daně všemi způsoby od všech v maximální výši, ať si můžeme financovat ty naše nesmyslné a drahé státní projekty, na kterých si mastí kapsy jen několik málo osob spřízněných se státem a přitom společnosti nic nepřinášejících. wild times… there is an uneasy feeling in the body politic… rand paul has a good chance to become the next president of the united states… wouldn’t that be a game changer? The pitchforks have already lost most manufacturing jobs to people who offered a better value to cost ratio. Apple has thus already moved less demanding operations overseas. Rather than expending their energy to advancing their skills — and thus sustain their six fold prosperity advantage over the world average — a voter lemming pitchfork majority is desperately seeking to milk a few more percentage points of production from Apple. They do not remember the many great companies of the past, whose demise depended on very narrow margins of competitiveness. Those were individual failures though. What Americans will experience under their newfound pitchfork mentality is systemic failure, and decline. What you are witnessing is the unfolding of American prosperity. Now close to the threshold, Apple is very likely to be overtaken by foreign competitors who will use not only foreign manufacturing, and also sizable foreign profits, but also foreign design and foreign capital. Rather than expending their energy on how to outcompete Samsung, Apple executives are wasting time trying to convince the American pitchforks that they are worth their earnings and that Apple does the most good to the American people when it recycles its profits into the exceptional people it employs, not government programs. Not even European welfare states will drag individual companies into a political colliseum to apologize for legal but supposedly unpatriotic behavior. The day that a now pitchfork holding American public will experience the results of its self destructing near sightedness is not far off. This is the spectacle of decline. Michael — check out deficit as a percentage of GDP, same source. 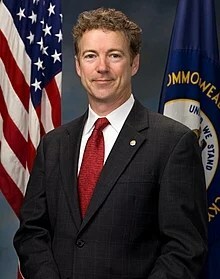 Hailing from the great Commonwealth of Kentucky myself, I am extremely proud to call Rand Paul my Senator. He hits the nail on the head on almost every topic. I stand with Rand!!! FY2010 – $3.457T – Obama’s first budget. That’s a total of 4.7% over Obama’s first four years. If you remove Obama’s stimulus from FY2009 spending (about $200B) the increase over Obama’s first term is still only 11% – as opposed to 30%+ for each of the two Bush terms. See “total outlays” on pages 24, 25. Um, Michael? You put “Obama” and “controlling spending” in the same sentence? Really? I must have missed something. Please link to a chart that demonstrates this interesting claim. I agree the tax code is ridiculously complex, and this Apple witch-hunt is embarrassing. Of course anyone that thinks the US corporate tax rate is too high should look at after-tax corporate profits. As far as “greed for other peoples money” is concerned, I blame the people that spent it by raising spending and cutting taxes (Reagan, GW Bush), not the people trying to pay it back by controlling spending and raising taxes (Clinton, Obama). on May 22, 2013 at 3:09 pm Ron Mitchell Jr.
Rand Paul along with Ted Cruz may be the ones to bring the Republican Party back from the brink of RINO policies and platforms.